"I have known him since he was a kid, I lived with him all his years since before he turned pro. I spent more time with him than anyone else so I know his strengths and his weaknesses." He had to return home after only three days but Paolo Tiralongo was always part of the Vuelta. He did not watch it on TV because it was too much suffering not to be in the peloton but he was always in touch with his teammates. The Italian Astana rider tried to defy the advice of the doctors who had recommended the withdrawal after his crashand a tough night as a result of more than 30 stitches in his face. He appeared at the start despite a swollen eye but the pain was too strong and also the brave Tiralongo was forced to surrender. "During the Vuelta, it was not easy either to retire or stay at home," he told Tuttobiciweb. "I could not watch the stages on TV, I only followed that of Andorra and the last three. I got nervous, I was sick, you know, I had made many sacrifices to get to the top and it was all gone in an instant. I knew that victory was within our reach so to go home prematurely was a big disappointment. I was in touch with Fabio every day before and after the stage and called the other teammates Rosa, Cataldo, Landa and the technicians. You have no idea how much I talked to Martin (Giuseppe Martinelli, ed.) and (coach Paolo, ed.) Slongo. I was a participant and at times when things were not going in the right direction, I felt compelled to cheer them on, increase the morale of the team, to remind them that they were strong. "To see Fabio on the top step of the podium in Madrid was a great thrill. I admit that I was in tears because I know the sacrifices they endured and how far he had traveled to get there. I repeat to exhaustion that the sacrifices always pay off in life. His result is a proof. To get together for dinner with all the boys and the red jersey in the middle of the table in a nice restaurant in the Spanish capital was just a worthy culmination of a project that began long time ago." Tiralongo and Aru have a very special relastionship. "I have known him since he was a kid, I lived with him all his years since before he turned pro," Tiralongo said. "I spent more time with him than anyone else so I know his strengths and his weaknesses. I know that he trusts me blindly and he listens. We just have to look at each other to understand. On Tuesday morning after the end of the race he was already at my house and we could talk calmly of these three weeks full of ups and downs. He had days of crisis in which he was nervous alternated with others in which he felt great. In this Vuelta there was a bit of everything, it was not easy to win. The whole team has done its best. "He has grown up athletically but also as a man. Today he is very convinced of his means. The rest is as you see it: a simple guy who is so humble and determined and professional. He is very attached to his family and girlfriend Valentina. He knows what he wants, is very demanding and does not leave anything to chance. He is really meticulous and happy only when he has given 100% of himself. To be on top every day is not easy. Indeed it is a pressure that few are able to handle. He is a born leader. As I have repeated over and over again, a great rider not only needs the physical skills but also the mental strength. The head is 80% and it is especially crucial on the bad days. In the mountain stage with Mortirolo and Aprica at the Giro, for example, Fabio showed to have a fighting spirit out of the ordinary. He could have cracked but instead he limited the damage. A day of crisis like that one certainly made him stronger. "The pressure? I do not think he suffered from that. He is the first to expect so much from himself. He knows that the relation to the media and the fans is an integral part of our work. Hedoes it willingly and as a team we can also help him. Surely this year's Giro and the Vuelta were also fundamental experiences for him to learn to handle the pressure that has been created around him. "Sometimes Fabio says I'm his brother and sometimes he says that I am his father. It is a bit confusing, but in fact I am too young to be compared to his dad and too old to be compared to his brother. Fabio is tough but also a big head. He has his own ideas. We discuss but never fight. We are a solid group, built day after day, race after race. We have to work together and improve. "Other anecdotes? Fabio is superstitious. You may have realized that he never uses the the word victory before he has achieved it. He wears a wrist bracelet like his girlfriend Valentina and does never take them off. On his bedside table he has a phone and, at times, English books. Apart from these curiosities, it must be said that Fabio is predestined. He has a mentality that makes the difference. Those who fall in love with the one-day races vanish, those who head to the Grand Tours remain. There are not many. In the future he will win a lot, including the Tour de France." 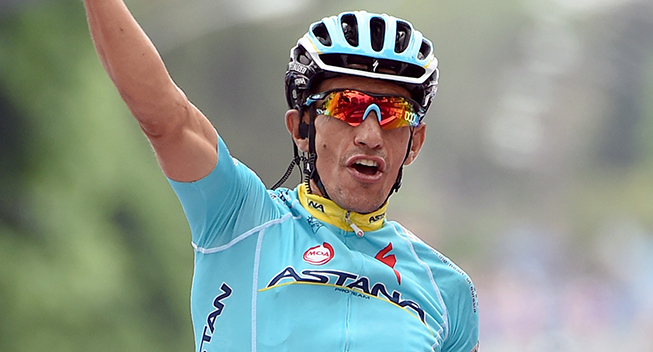 Despite being 38 years of age, Tiralongo recently extended his contract with Astana.